Death of a Myth Maker by Allana Martin, a Mysterious Review. 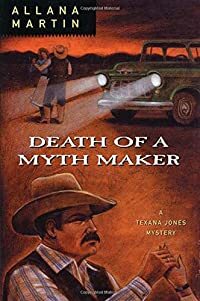 Review: Death of a Myth Maker is the fourth mystery by Allana Martin to feature border resident Texana Jones. Sometimes a mystery book seems to hit all the right notes, and Death of a Myth Maker is one of those mysteries. Martin effectively transports the reader to southwest Texas along the Rio Grande with mesmerizing descriptions of the area inhabited by Texana Jones. The characters are richly drawn, and the mystery simultaneously simple in its scope yet complex in its detail. Death of a Myth Maker is certainly one of the best mysteries to be published this year, and is highly recommended.